Pezzetina is a collection inspired by nature, a thought and a unique inspiration that materialize in an original product with fluid and expressive forms. Archirivolto Design has chosen for this new collection a creative concept away from the usual geometry, rethinking and reinventing the ancient relationship with mother nature in order to build a renewed balance in our homes between nature and technology. 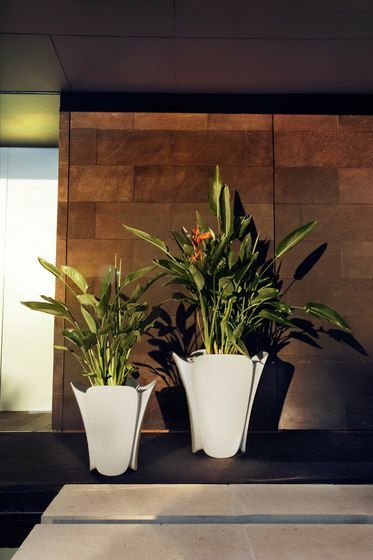 A 100% organic design with elegant shapes through a 100% recyclable product. Claudio Dondoli (*1954) - Marco Pocci (*1953), Italy. Archirivolto was founded in 1983 by Claudio Dondoli and Marco Pocci as an industrial planning, design and architecture studio. While studying Architecture in Florence, Claudio and Marco and some friends put up an experimental theatre group. When they decided to focus their joint efforts on design, consolidating their ties of friendship, their interest in theatre strongly influenced the setup of their new studio, drenched in creativity, sense of reality, respect and attention for thE public .